These chairs consist of a square moulded top rail with carved flower decoration to the outer corners sweeping down to moulded arm supports with padded leather armrests. The backs are upholstered in leather and also having a loose buttoned cushion with piped edging, the arm supports are of scrolling design supported by a turned and fluted column. This leads down to the upholstered leather seats with moulded front rail below of bow form with carved floral decoration at the outer corners leading down to turned and fluted legs to the front with splay back legs terminating on original brass & ceramic castors. 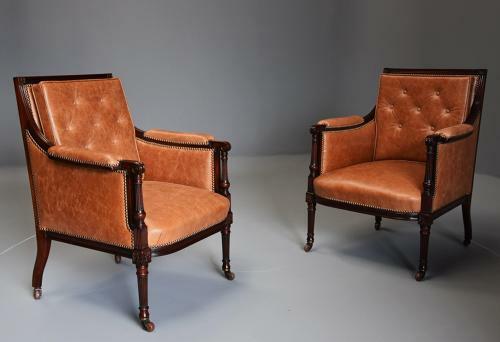 This pair of ‘His & Hers’ bergere library chairs would have been made for a male and female (or couple) as one is fractionally larger than the other in height and width. 'David Morgan & Co' was a large department store established in Cardiff in 1879 by David Morgan, initially they catered mainly for the drapery trade and then later David's son, John Llewellyn Morgan extended the business into retailing furniture, the store was eventually closed for business in 2005.